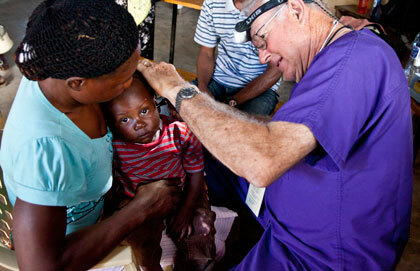 What is Pinnacle's Mission in Haiti? Haiti is the poorest nation in the western hemisphere. The resources have been devastated, the government is in turmoil and corruption is rampant. Many people say there is no hope for Haiti. So it may be for the “nation” of Haiti. But our Mission is to the people in Haiti. And the people in Haiti are just like us. They may not have the financial, educational, medical or environmental resources that we at PPC have but they are our Christian brothers. They worship God, create “meeting tents”, build churches, support their neighbors and spread the word of Jesus Christ. And they do indeed have and demonstrate “HOPE”! Those of us, who as your representatives have had the good fortune to experience all that they do with their little resources, were very moved. Their joy, their devotion, their refuge in the church is inspirational. We wish everyone at PPC could experience that. Still you should feel the joy knowing that we at PPC are supporting these Christian brothers and sisters by giving some of what we have. Food, clothing, medicine, funding for schools and rebuilding of churches is practicing what Jesus taught us: “feed the hungry, clothe the poor and take care of the sick, for whatever you do for one of these, my brothers, you do it for me.” We are brothers and sisters in the One Church, the One Body of Christ.